Nobody told me that being a mom would mean I'd spend most of my time in the kitchen. I think I would enjoy cooking if I understood the process better and didn't have to rely on recipes all the time. I often experiment, but only in tweaking recipes simply because I don't have all of the actual ingredients. It's fun to invent my own substitutions. Sometimes they work, sometimes they don't. I have learned not to tell my husband that I experimented with his meal until after he has tried it...I guess it hasn't worked more than it has. The other day I had a vision. I was laying in bed trying desperately to catch a quick nap while my 4 kids were locked in their rooms supposedly taking naps as well. My head was slightly aching, perhaps due to tiredness and perhaps due to hunger, but I couldn't risk taking time to eat or I might lose my chance at a little rest. So I was just laying there, possibly thinking about what the heck I was going to cook for dinner yet again, when all of the sudden, breaded shrimp danced through my thoughts. Yum. Yes, that would make a great meal. 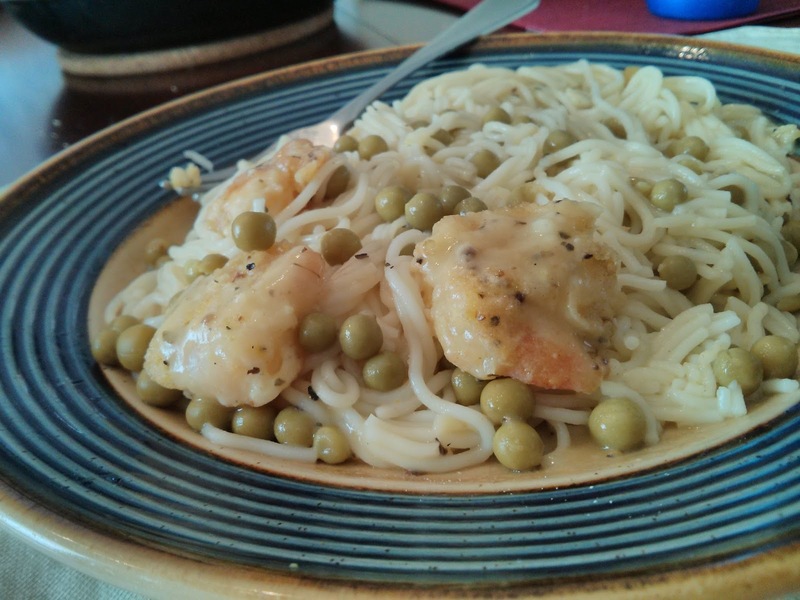 I knew I had a little bit of shrimp in my freezer and it's something even my kids love. Why has it never occurred to me to bread it? I bread chicken all the time, why not the shrimp? But it wouldn't be enough. It would need noodles. My kids love noodles. But what in the world can I put on the noodles?? I can't have dairy currently (seriously upsets my newborn), and I have a mouth full of canker sores so a marinara sauce won't due. What about a garlic lemon butter sauce? And then it came to me how I might go about creating my own garlic lemon butter sauce. Veggies? Why a green salad with bright red tomatoes would be the perfect touch! I was in love and knew that I just had to try it! If it failed, there's always take-out. I found myself almost giddy with excitement to cook dinner (that never happens!). My 6 year old daughter was my little chef helper and proved herself most worthy. In case you would like to replicate my meal, below are step-by-step instructions exactly as they occurred (or as I remember them occurring anyway). I had eaten most of the shrimp. 1. Put water in pot and turned up heat for it to boil. 2. Meanwhile, I defrosted the shrimp under cool running water. 3. I threw together some flour and lemon-pepper seasoning in a bag and cracked an egg in a small bowl. 4. I tossed some butter (margarine, actually...less dairy) in a frying pan and began de-tailing the shrimp while the butter began melting (it's the already-cooked kind of shrimp). 5. My little chef helper proved most helpful as the melting butter began sizzling and I was still pulling tails off the shrimp! She pulled off the tails, patted them dry, and plopped them in the egg bowl while I took them from the egg, shook them up in the flour bag, and placed them in the sizzling butter. 6. At some point the water boiled and I threw in about half a package of Angel Hair pasta with some oil and turned down the heat, admittedly proud of myself for remembering to turn down the heat and avoiding another boil-over. 7. I had to add more butter to the pan because the shrimp was sucking it all up too fast! After flipping the shrimp so both sides were browned, I removed them to a plate and stuck it in the microwave on the setting "hold warm." 8. I threw in more butter to the pan to start the sauce, but it began browning too quickly and was sizzling like crazy and I was afraid it was going to burn and ruin everything! I panicked and threw in some water. The plan was to mix in the flour from the bag first...oops. 9. I decided I would just mix the flour in with the lemon juice....until I realized we were out of lemon juice. Luckily we had some limes. Lemon...lime...both sour. I squeezed a single lime in a cup and poured in all the flour from the breading bag. Way too much flour. Squeezed another lime. Still too much flour. So I added more water and poured it into the butter/water mixture in the pan while stirring not-so-gently with a whisk. 10. I tossed in a buillon cube or two as well. 11. I threw in some seasonings: Basil and meant to do Oregano, but couldn't find it so I just did Italian Seasoning (I have since found my Oregano). 12. The sauce started to get really thick and seemed more like gravy. Definitely too much flour. I just added more water. 13. Oh, don't forget to drain the noodles. I did. Yes, they were a little soggy. Insert this step a little earlier when you make it. 14. Kids were going crazy, husband was home, I was now exhausted from cooking and didn't have energy to prepare a simple salad, but we needed a vegetable. Then another vision came to me. Peas. 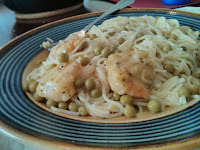 Peas mixed with the noodles and sauce. Perfect and even easier than preparing a salad. 15. And then I saw the garlic sitting there unused. Oh yeah. I sprinkled in some garlic powder. So there you have it. My masterpiece. The sauce on its own had more than a hint of lime flavor, but actually was very good mixed with the noodles. My husband even gave the meal two thumbs up! (Yes, I waited until he had eaten it to tell him the whole thing was completely from my own brain and not one bit of it from a recipe). We'll call this meal a success. I love it! That is how I usually make our meals too. I'm glad it turned out well. HAHA! That sounds all to familiar. Except my helping hands are torturing the baby and inevitably something burns and I have to add in a few salvage steps, or in the case of the other night I just scrapped the current meal and made something else. I'm excited to try this though, as soon as I have all the ingredients. I have flour and lemon juice. And oregano ... I think ;) BTW this is the kind of blog I want to start: cooking with kids. That way moms can get a true estimate of how long a 30 minute meal is really going to take!!! Good job!